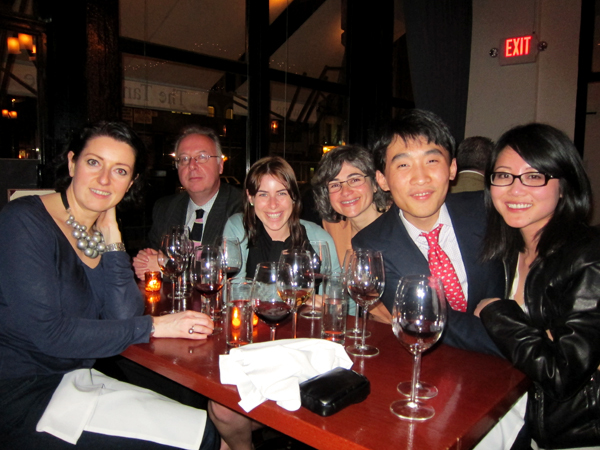 The Lopez de Heredia wine dinner at The Tangled Vine was a fantastic time last night. I felt a tad (um, a lot) out of my element because I honestly still feel like I know nothing about wine, but I am learnin'. And hanging around people passionate and so knowledgeable about it is pretty great. I have seriously got to get to Europe as soon as I can. I realized I took no pictures of the actual wine last night - oops. Clearly my thoughts were still on the food, even though that was not the focus of the dinner. And we met Maria, the winemaker! (Pictured in the middle of the group next to Jimmy.) She was very charming and lively (she's got those like sparkly eyes going on for her). Jimmy felt she was way too much cooler than us for us to interact with her. This is probably true. Tonight I'm off to another dining adventure in Queens for some authentic Thai (nope, not SriPraPhai). Back with that report soon! Those wines were so awesome. Very nice! And too cool to see the winemakers interpretation of wine pairings. I suspect she would love to teach you properly, if for no other reason than to allow you to taste the love and really appreciate her product. Give her a chance. How exciting. An upcoming Europe trip! when is this europe thing! ?